The author lives with her husband, Frank in San Diego, California. They have six children between them and 10 grandchildren. In between writing, she likes spending time researching for her novels, and traveling with her husband and grandchildren. She sings on the worship team at her church and serves on the church board as well as the Board for the San Diego Christian Writer's Guild. "Martha" is her second novel for Revell. Her third novel, "Mary Magdalene" will debut June 2011, and her fourth novel, "Claudia, Wife of Pontius Pilate" will appear in June of 2012. Martha, A Novel by Diana Wallis Taylor is about the Biblical Martha. After the death of her mother, Martha took on the care of the household and her family: her brother Lazarus, her sister Mary, and her father. She was always the caretaker, leaving her to wonder when she would find time for her own life or for love. They were a faithful Jewish family, believing the Messiah would come one day. And one day He did come to their house! Scripture tells us Martha was busy preparing a meal and making her guest comfortable while her sister Mary sat at his feet listening. Martha asked Jesus to tell her sister to help. Her brother Lazarus died and was raised from the dead. Through the Holy Scriptures we know that the family was very close to Jesus when he walked on earth. 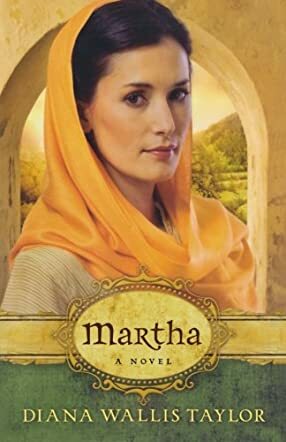 Martha: A Novel demonstrates how her encounter with the Lord affected her. Through this book we experience the resurrection through a whole different light. Taylor stayed true to the scriptures and yet brought out points I had forgotten. Diana Wallis Taylor has a gift for bringing Biblical people to life. She gives them great depth and helps contemporary people to understand them. The world they lived in was so different from ours, and yet Taylor manages to recreate that world on the pages of her book. This is a delightful read, filled with inspiration. I'd read Martha's story in the Bible but had never truly felt the depth of her role. Martha is a Christian novel that will thrill Christian readers. I did not want this book to end. I see Martha in a whole new light...Taylor opens the Bible to all. After reading this novel I do not see Martha the same way again. Maybe I find myself in her. With the grace of God both my parents are alive and healthy but in their busy life, I do take care of my younger sister and take up her responsibility,and maybe my dreams are similar to Martha too, and yes like the way she followed Christ, I love Christ too! I love the work of Diana Wallis Taylor, I feel honored to read you novel.